Following government discussion of whether or not investment in infrastructure will or will not improve the economy and boost job growth seems like a no-brainer for the STS crowd (i.e., as a rich topic for discussion); however, to the best of my knowledge, this is relatively rare to find in the pages of our journals (even if the insights we could glean may very well have helped such dire governmental circumstances). Eduardo Porter, writer for the New York Times “Economic Scene” section, recently wrote a piece on infrastructure. The piece, “Confronting Old Problem May Require a New Deal,” provides readers with the predictable ‘public’ perspective on the relationship between employment and infrastructural development painting the all-too-familiar picture that more of the former requires more (investment) in the latter. This is hardly new. During times of economic strife, low investment in (even crumbling infrastructure) further diminishes job growth on a grand scale (which we’ve discussed with regard to Germany, the US, and the austerity-infrastructure relationship). In “Freedom From Fear,” his history of the United States through the Great Depression and World War II, David Kennedy notes that fears that what Keynes called “technological unemployment” might become a permanent feature of the labor market, especially among the less skilled and the elderly, date back to the administration of President Herbert Hoover. The inability or complete failure of the American government to produce enough consensus regarding new programming as aggressive as those of FDR’s era has lead to concerns and fear that we are on a path toward permanent employment stagnation. “It works best if you hire people that would not otherwise be hired, to do something productive that is not already being done by somebody else,” said Lawrence Katz of Harvard, formerly chief labor economist in the Clinton administration. Not every unemployed worker may be qualified to build infrastructure. But many might. Today, there are 1.5 million fewer jobs in construction than there were before the financial crisis six years ago. Plenty of unemployed workers out there know how to build things. Only, we don’t need house-builders, we need re-construction, de-construction, and renovation. Perhaps that is not so unlikely to be fulfilled; after all, the cost of borrowing money is low and the amounts of money needed for such massive projects is available, but it simply will not — no matter how many libertarians tell me so — be done if not by the government. My intuition is that large firms in the US that use such infrastructure with regularity would only step-in after it all far too late … we are getting closer by the day, after all. 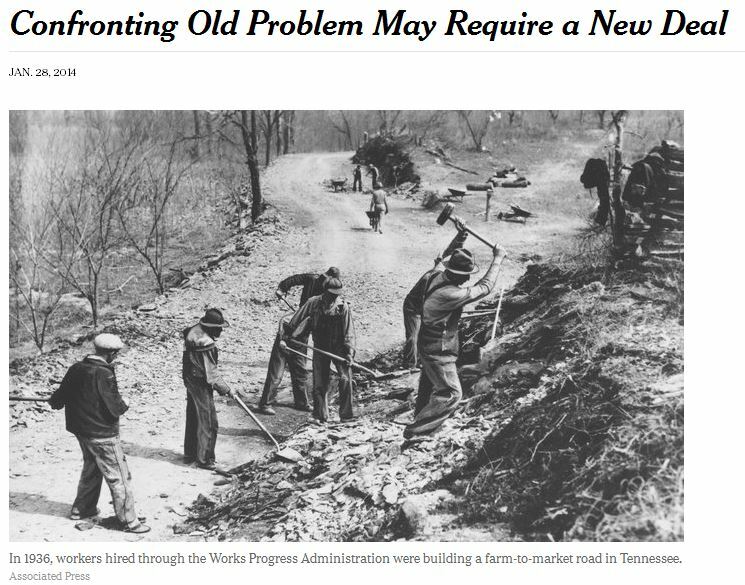 The last serious investment in nation-scale infrastructure might very will be during the Great Depression. This entry was posted in Government, Infrastructures in the making, Uncategorized by Nicholas. Bookmark the permalink. too many moving parts in the federal govt for me to get my head around but my usual go to talking heads all said that if healthcare reform proved too hard to get done than the feds were no longer up to the task of large scale projects, this was in the halcyon daze of Obama for universal healthcare, nuff said? life in the ruins that the new project as I see it. That is a fair point and one that I’ve thought of quite often. I was beginning to get there, playing with the title — the “new new” part — trying to determine, what would that look like? I don’t mean: what would it take for the Feds to get their act together for the common good of this country, but (to my mind) political differences are not even political anymore. I meant something closer to your point: how do we live in the ruins or keep ruins from getting too ruined to use? I don’t know, but a shift in thinking on the ground may be the key, given that centralized intelligence is no longer a humorous oxymoron. ok, but really who is the “we” and how will we all get on the same page, or are we pretty much going it alone (plus maybe a spouse or such), I go to various public interest type meetings ever other week or so and I’ve yet to leave with any substantial sense/signs of solidarity, you? I don’t have a ready-made answer to that one, that is, the “we” challenge stated above. My intuition has always been that Freud was right about that, that, in fact, we are all totally and insolubly on our own. Still, while that may be true in an abstract, absolute sense, that does not change the fact that pickets of individausl do think alike and find solutions to shared problems. That being the case, perhaps the middle is an answer … I don’t envision a “protestant ethic” of any formation to sweep through the nation and reshape the masses; however, I do not anticipate all of us returning to some sort of post-modern version of Hobbes’s state of nature. Perhaps the answer then is almost tribal rather than national or natural … Sorry, not a great answer. I think “tribal” is likely as we see in failed/failing states and street-gangs, not sure if slightly more kibbutz-like models could be a kind of middle-ground in the process but the long run looks mighty grim I’m afraid given global warming and all, makes me sad. That may be the case; in fact, you’re probably right that ‘tribal’ just does not cut it as a term or reality. Still, I guess I keep falling back on the idea that this “disintegration” of societies (such that Durkheim himself might be bothered) is concerning … I mean, has organic solidarity finally failed us all completely? not sure that there ever was “organic solidarity”, my sense is that with our technologies we have created relationships/effects that far outstrip our abilities to grasp/manage them, that our cognitive-biases, and our other limits, are just a terrible mismatch for the environs that we have created, we don’t do well with complexity, causality, compromise, thinking long-term, and such. In that case, there is one answer available to your previous question about how to “live in the ruins” [note, if you are at all a James Bond fan, in Skyfall there is a scene that plays with that idea and every time we say it, it reminds me of the film]; instead of advanced theories of planning, we need advanced theories of reaction. If most of what we have available are relationships so complex that unanticipated consequences are no longer the exception but the rule. In cases like that, Perrow said we need better and better planning and redundant systems … but an alternative would be to generate theories of reaction. Rabinow, like John Caputo, is asking us after Foucault to think about taking not-knowing seriously as a sort of ethos, not sure if we can really manage/handle much in the way kind of practice but worth a shot I think. I’ve read most of antifragile and I don’t think he takes collapses very seriously in terms of how disastrous they are likely to be (he’s kind of creepy/arrogant in his talks too) and seems to naturalize things/events in the way that economists do, at least that’s my hazy recollection of the book, don’t know the other but will keep an eye out for it, does it tell us how to get feral or just predict it as a kind of fall?